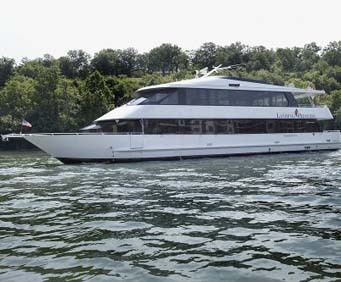 Cruise Lake Taneycomo and its 2,000-acre Branson Landing waterfront from the comfort and luxury of the 100' yacht, the Landing Princess. The elegant ship is lined with windows providing passengers with two climate controlled decks and amazing views from any place inside the cabin. The sights and sounds of Branson will seem that much more relaxing from the peaceful atmosphere of the Princess and is the ideal dinner experience found in Branson. Commentary is provided from the cruise's guide who presents a historical account of the rich culture of the Ozark area as well as how Branson got its beginnings and its growth to becoming a heavily visited city. 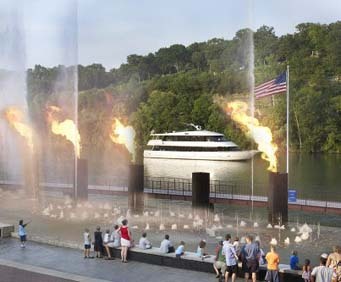 A highlight of the sites seen is the $7.5 million dollar Branson Landing Fountains. This features an amazing production of synchronized water, neon lights, music, and pyrotechnics that are nothing short of outstanding under the evening sky. Read below for the different tour options. Enjoy a scenic evening ride aboard the Landing Princess on the Ozark Mountain Dinner Cruise. This luxury yacht will give you gorgeous views of the surrounding area and sunset from its three open decks. 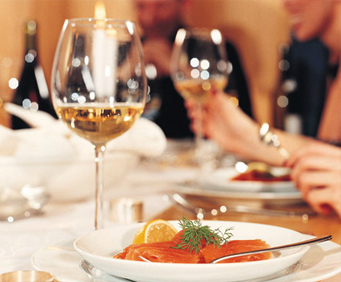 While you're cruising along, enjoy a delicious buffet with various Ozark specialties for you to sample. Onboard, you and your dad will be greeted with a complimentary glass of champagne as you head out on the waters off the coast of Branson. Give your dad a Father's Day Cruise to remember, including a delicious meal of barbecue baby back ribs and even a cash bar with many fine spirits. Experience the Branson Landing's 4th Annual Liberty Light-Up Fireworks Display from aboard the beautiful Landing Princess. This cruise will be a fabulous celebration that will allow you to see one of the most spectacular fireworks displays in the area. Snacks are available for purchase. Make your Thanksgiving special with a cruise on the Landing Princess. 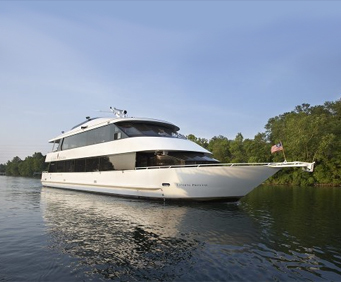 On the cruise, you will enjoy a fantastic traditional Thanksgiving meal while enjoying a relaxing cruise along Lake Taneycomo aboard the Thanksgiving Day Cruise on the Landing Princess. Celebrate New Year's Eve with the New Year's Eve Party & Dance Cruise on the Landing Princess. Dance the night away while you enjoy mouthwatering hors' d oeuvres, huge dessert bar, drink specials, party favors, a live DJ, hot dance floor, raffles, and a midnight toast! It's out with the old and in with the new on the New Year's Eve Party & Dance Cruise on the Landing Princess, including a spectacular fireworks show! "Loved the boat and crew." Loved the boat and crew. Dinner was just so so. The cheesecake was great. We bought our photo taken when we got on the boat. The lady gave us an additional photo of some eagles that she photographed on a earlier excursion which was very nice.